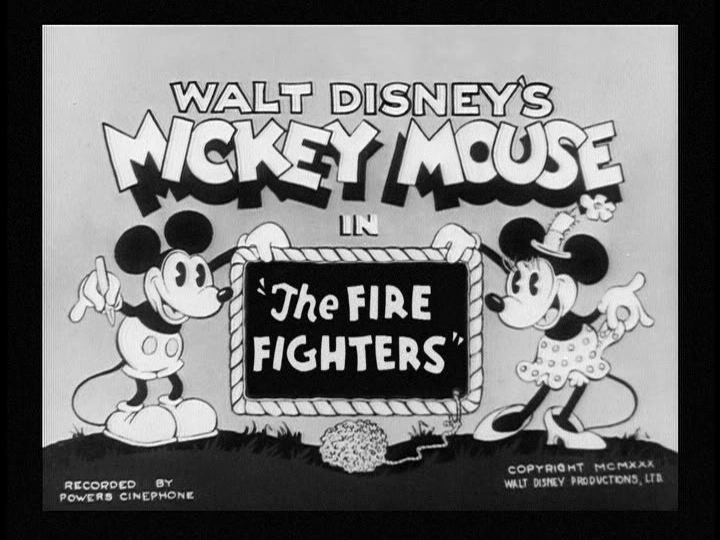 On June 25, 1930, the Mickey Mouse short film The Fire Fighters was released to theaters. The short was directed by Burt Gillett. It’s a quiet night at the firehouse, with all the fireman asleep in their beds, including Fire Chief Mickey. Suddenly, someone comes running down the road, shouting out that there’s a fire, with a building seen burning in the distance. The bell sounds the alarm, and the firemen quickly rouse themselves and head out, except for Horace Horsecollar, who finally wakes up and rushes to follow the rest of the team. Using a cat to sound the fire engine alarm, the firemen speed out into the night, with Mickey leading the charge. Unfortunately, most of the fire engine and team get left behind as they travel over some rocky terrain. The burning building begins to sway side to side, with people jumping out in all directions before scrambling to safety. The citizens of the city cheer as they see the firemen approaching, although when Mickey turns around, he is rather annoyed at finding he is the only one there. He grabs his fire hose and attaches it to the closest hydrant, and sets off to take out fire. The hydrant doesn’t seem to work, so Mickey milks all the water out that he can into a bucket and runs to the building, not realizing that he’s spilled all of the water most of the way there. He tries again, a bit more carefully, although he spills the water before it can hit the flames. Meanwhile, Horace has been taking water from a nearby pond and using it to put out the flames on the first floor. Up at the top of the building, Minnie Mouse, who seems to have been asleep, opens her eyes and screams for help before she is consumed by smoke. Mickey, alarmed, bravely runs into the building, but is soon chased out by flames. He uses the ladder of the apartment building next door to jump into a pair of pants left on the clothing line, then pulls himself close to the burning building to catch Minnie as she falls out of the window from exhaustion. The flames break the clothing line apart, but the pants act as a parachute to send them safely to the ground. The two kiss and embrace. 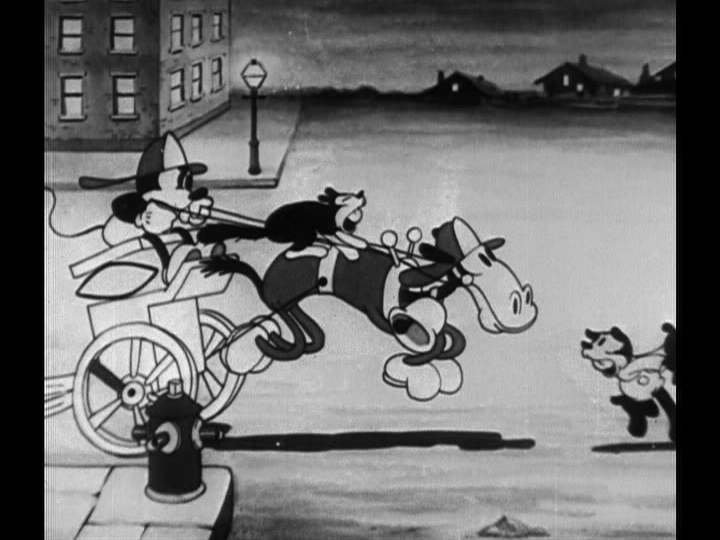 Posted in Uncategorized and tagged 1930s, Black and white, Mickey Mouse, Short film. Bookmark the permalink.